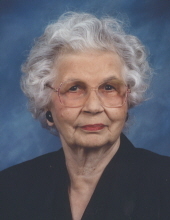 Funeral service for Mrs. Janie Sevelle Yocom Vance, 99, of Gilmer, TX will be held 2:00 PM Friday, April 12, 2019 at Croley Funeral Home in Gilmer with Rev. Matthew Smith officiating, interment to follow at Sunset Memorial Park. Family will receive friends one hour prior to the service at Croley Funeral Home in Gilmer. Mrs. Vance passed away Tuesday, April 9, 2019 in Gilmer, TX. Janie Sevelle Yocom Vance was born January 28, 1920 to A.O. Yocom, Sr. and Janie Shaw Yocom in Gilmer, Texas. Sevelle graduated high school there in 1939 and married David Vance in San Antonio in 1943 during World War II. She was a homemaker most of their married life, raising their only son in Grand Prairie, Texas. They moved back to Gilmer after retirement in 1978. She was preceded in death by all of her seven siblings. Survivors include Donn Vance and wife, Gaynelle of Lufkin, Texas; granddaughter, Andrea Im and husband, Albert of Austin, Texas; and grandson, Brian Vance of Lufkin. In lieu of flowers, memorial contributions may be made in memory of Mrs. Vance to the First United Methodist Grounds Beautification Project, 105 N. Montgomery St. Gilmer, TX 75644. To send flowers or a remembrance gift to the family of Janie Sevelle Yocom Vance, please visit our Tribute Store. "Email Address" would like to share the life celebration of Janie Sevelle Yocom Vance. Click on the "link" to go to share a favorite memory or leave a condolence message for the family.